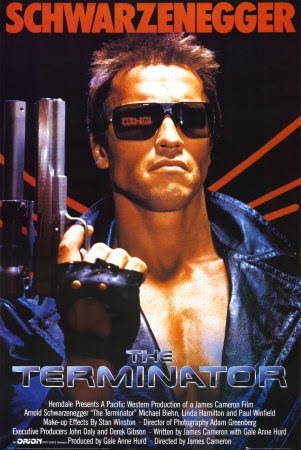 James Cameron’s film The Terminator is a hybrid of genres with action, science-fiction and horror being most notable. It contains many of the generic conventions of each of these three genres. Producers use genre to help sell their films, audiences use genre to help choose what films they will watch and even the creative people behind the films use genre to help script their films. Genres are about repetition and formula but they are also about creating expectations and often subverting those expectations. Genre films have to tread a fine line between being familiar enough to entice and audience but also being too repetitive and predictable. The Terminator ensures it will appeal to a wide ranging audience by containing many conventions of different popular genres. This means there will be much that is familiar to audiences about it but there will also be a lot that is new to them as well. Generic conventions can be divided into iconography, narrative and thematic. I will focus on the iconography of The Terminator, analysing what conventions it uses to appeal to horror, action and sci-fi fans as well as how it updates, changes and subverts expectations that the audience might have. 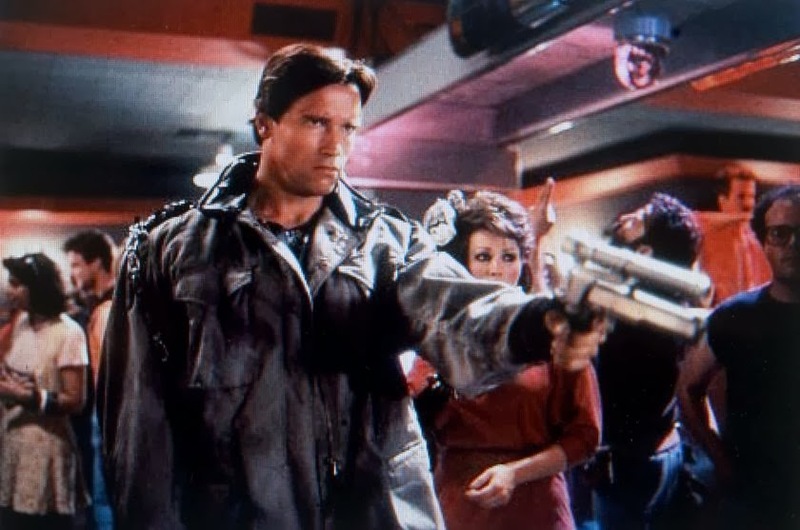 Although early in his career, Arnold Schwarzenegger was already becoming typecast in American films by the time he starred in The Terminator in 1984. He was known for his huge muscles, a physique crafted from years of bodybuilding and for his Austrian accent. He has already starred in fantasy action films such as Conan the Barbarian and looked like the kind of alpha male hero Hollywood could feature in an action film. However Arnold Schwarzenegger was cast as the villain in The Terminator to help make the hero look like more of an underdog and therefore make the film more suspenseful and exciting. The early scenes of the film feature a fight between The Terminator and some punk youths. This involves a knife which should be a terrifying weapon. However the Terminator is not frightened by the youths, their knife or hurt when he is stabbed. This sets him up as a dangerous villain that will be hard to kill. The film also features lots of chases, both on foot and in cars. These are fast paced and exciting for the audience and are shot, edited and scored to make them appear tense and thrilling with the sound of screeching tyres used to emphasise speed. Guns are often used and the sound of gunshots can be heard which also adds excitement as guns can be used to hurt people from a distance and they are a symbol of power and deadly force. The Terminator also features fire and explosions which are major signifiers of destruction and are caused by using weapons. The tension around an impending explosion is built through intercutting between shots of the fuse burning and then shots of the people who may be affected by the explosion as in the scene where Reese puts a bomb in the tanker that Sarah is being chased by. 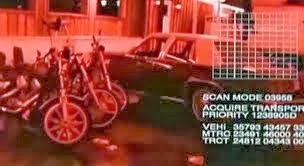 Police cars and police uniforms also feature in The Terminator but they are not the heroes of the film, as is often typical with action films. The hero is a plain clothed soldier from the future and to further subvert expectations, the villain drives a police car at one point. The Terminator also has many iconic conventions of the science fiction film. It frequently uses special effects such as lasers that fly across the screens, representing the firepower of futuristic weaponry. The idea of a robot that looks human not something that has been invented yet and is therefore futuristic. The audience is made aware that Schwarzenegger’s Terminator is not human in a number of ways. There are point of view shots that have a red tint and written data scrolling on screen and this is accompanied by robotic noises so the viewer knows they are seeing what the robot sees. Eventually it is revealed that beneath the skin, The Terminator has a metal skeleton with bright red eyes. This signifies strength, anger and death and makes him appear to be from the future and also dangerous and almost impossible to kill. There are also scenes set in 2029 when machines are hunting and killing humans. The future is bleak with destruction everywhere and humans living underground. The machinery looks unfamiliar to modern audiences and the world is unrecognisable. The connotations of machinery that flies through the sky shooting lasers while humans scurry around on the surface trying to fight back is that technology has taken over the planet and has become more powerful than humans. This is a typically dystopian vision of the future that is reminiscent of other science fiction films such as The Matrix and even Jurassic Park where technology allows people to re-create dinosaurs than then go on a rampage. 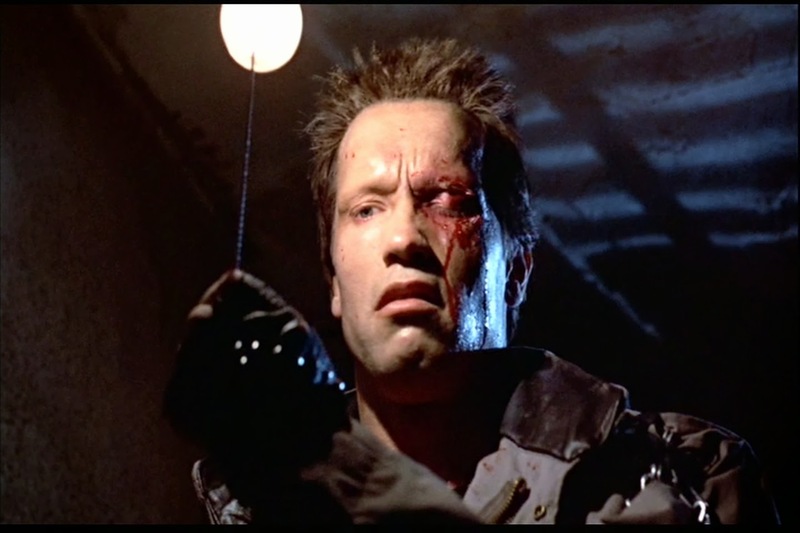 The Terminator also has elements of the horror film in its iconography. James Cameron uses suspenseful music during chases to build the idea of threat. Most of the film takes place at night with low key lighting. The idea that only bad things happen at night and the poor visibility of night time adds to the excitement and suspense. There is blood and gore and a focus on injuries in some scenes. For example when The Terminator cuts his arm open or takes his eye out, there is the kind of graphic detail that might be expected in a horror film. Though the killer uses a gun as his weapon of choice, he also hunts down women who appear weaker and more innocent than he is. This focus on female victims and also that we see from the killer’s point of view is similar to slasher film conventions. The fact the killer murders his defenceless victims in cold blood and never shows any remorse or emotion is also similar to slasher film villains like Michael Myers and Jason Vorhees. The Terminator is also occasionally shot from a low angle to make him look dominant and Schwarzenegger’s face never changes to show that he is robotic, inhuman and impossible to reason with... just like a slasher killer!